The New 52 Batwing series is one that I hold in high esteem, largely based on the inaugural storyline that was among the best of the New 52 debuts. But each volume has been weaker than the one before, and Batwing Vol. 3: Enemy of the State continues that trend. Writer Fabian Nicieza, taking over from Judd Winick, is not telling Batwing's story poorly by any stretch, but neither are art and story on a high enough level to justify this series's continuance. I think more people would share my praise for Batwing had the series been collected differently. The first volume, Lost Kingdom, collects the first six issues by Winick and Ben Oliver; the second volume collects the Zero Month issue and issues #7-12, by Winick and a variety of artists. To that end, it probably made logical sense to the collections department to split the book that way, so there was one with Oliver's distinctive art and one with Winick and the other artists. But in fact issues #7-8 of the second collection, In the Shadow of Ancients, are the conclusion of that first storyline; art for both issues is by Dustin Nguyen, whose style is different than Oliver but he's certainly no slouch. Further, Winick's Batwing #8, for its sheer suspense, surprise, and emotion, probably ranks among my favorite single issues ever. Batwing Vol. 1: Lost Kingdom, with the first six issues, is a good collection; had they collected it with issues #7-8, going big like Batman and Robin Vol. 1: Born to Kill, I guarantee it would have been considered one of the best first collections of the New 52. Instead, Batwing Vol. 1 is just pretty good, Batwing Vol. 2 starts really well but isn't as consistently good as the first, and then Batwing Vol. 3 has trouble standing up to either one. Enemy of the State includes just six issues that tell two three-issue stories. Winick writes the first two parts of the first, and then Nicieza writes the other four. The two stories connect nicely and Enemy does for the most part read more like a big story in two acts than two disconnected Batwing tales. The throughway is one, the emergence of the new vigilante Dawn who is not surprisingly one of Batwing David Zavimbe's childhood friends, and two, David continuing to rebel against his corrupt fellow Tinasha police officers. All of this simmers in the first story and comes to a head in the second. What has been enjoyable about Batwing so far remains enjoyable here -- that David is "a Batman" not because of a crime against his family as a child but to atone for violence he himself committed as a child, and also that David must survive as one of the few honest cops on a corrupt police force, kind of a Gotham scenario set in Africa. Where the story deals with David's past trauma, and where he sets traps for the corrupt police that put his own life in danger, the Batwing story is at its most interesting. Among the difficulties, however, is that the writers begin to repeat themselves. Batwing's origin is borne from his having been forced to be a child soldier, as did the villain Massacre's, and then David's confidant Matu Ba came from a profiteering government family. That new character Dawn also came from David's orphanage, run by Matu, seems too similar and convenient, and the writers' attempt to shoehorn in Dawn's importance to David only accentuates it as a retcon. As well, Winick introduces Dawn as a benevolent government super-spy, and Nicieza somehow misinterprets this later and presents Dawn as a mercenary and assassin; the story wobbles a bit in this mismatch. Also, as has been the case before, Batwing's villains aren't that compelling. Massacre, with his skull mask and knives and mainly as drawn by Oliver, has been the series's sole frightening bad guy; as I mentioned in my review of volume 2, Lord Battle in his fur-lined cloak with giant hammer was pretty silly-looking, and his Blood Storm companions seemed straight out of the 1990s. In this volume, Batwing fights Father Lost, who starts well as a serial killer but loses it when the story gets into ill-defined mind control antics (and Nicieza perhaps overemphasizes Lost before Batwing at the start of his run). Batwing's conflict with the rich Marksbury family is better, in that this is a more down-to-earth story than Batwing versus supervillains, but it's not long before Nicieza has David fighting the more generic Sky Pirate instead. But it's in art most of all where the book has trouble; if there were lapses in Winick's original story, Oliver and Nguyen covered them up, but the artists that followed can't do the same for Nicieza. Marcus To and Fabrizio Fiorentino each offer standard comic book work that's inoffensive but undistinguished, with a tendency to bulk up Batwing's armor in a way that doesn't jibe with the character. I liked the touch of realism that artist Allan Jefferson brings for a moment, but in all none of the artists are well-served by the inkers, and the art is routinely sketchy and lacking in detail, such to make Batwing a dull book to look at. There's good drama at the end of Batwing Vol. 3: Enemy of the State with David both feeling responsible for Matu having been injured and intending to return to the violence of his childhood as a result, though the attack on Matu might have been more dramatic had it not been handled via spaceship. Of course we all know this title is going to take a left-turn with the next volume, but I don't mind that; I've felt for a while that Batwing's strongest story was its first, and maybe the title should have just ended with that. 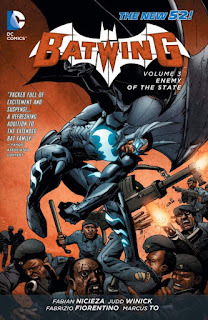 I'm curious to see how the new Batwing comes about vis a vis his family's pre-existing connection to Batman, and it seems not such a bad thing to preserve the "Batwing" name but give David Zavimbe his deserved rest.